Adjustable frame, Can be used at 24"- 28" height. 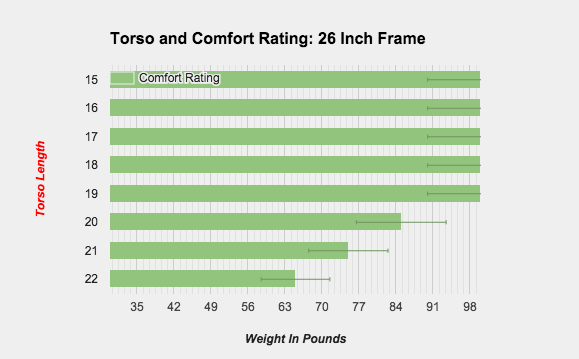 Optimized for 26 inch height - Which Frame Height is Right for Me? This is a great pack. I bought it so I would have one pack that could do everything I wanted and so far it has done just that. I have comfortabley used it for everything from a 10 day sheep hunt 66 lbs of gear to day hunts in my backyard with 10 lbs of gear. It’s very comfortable easily adjustable. No complaints so far. I may write a more detailed review of this pack at a later date but I wanted to get this up for anyone contemplating a purchase before Fall hunting seasons. Last Fall I retired my cherished 18 year old Kifaru Longhunter I used from '99-2016. I was initially skeptical but I quickly fell in love with my Brooks 7400. This is THE PACK for wilderness big game hunting! The design, materials and workmanship are flawless. - Internal load shelf - surprised at how well this worked for heavy elk hind quarters! - Simple but versatile compression system. This pack is no problem to have on your back while day hunting from camp yet can handle 130+ LB packing out meat. - Ultralight frame that support huge loads yet articulates and moves like a day pack. - Gun hook works really well. I tested this pack against a Kifaru and Exo Mountain and it was by far the most comfortable. I've tested it with up to 104 lbs and it performed phenomenally. My reservation with buying this pack was that I already had several large volume packs (Mountainsmith, Kelty, Jansport). However, the way this SO carries heavy weight is not even comparable to the traditional backpacking brands. The only reason I give 4 stars instead of 5 is the challenging experience with customer service. They had a recall on this pack b/c of incorrect buckles. They did not return my emails, then when I called them they told me they weren't sure how long it would take to fix the recall issue and send my pack back to me. Long story short, I had to call Argali Outdoors (where I bought the pack) and get them to address my issue with the SO folks. That said, I believe they are great folks. I just had a not so great experience. In the end they eventually fixed the recall issue in a prompt and professional manner. I've been stomping around my neighborhood with 65 pounds in my old dead bird naos 70 liter pack. When the brooks arrived, I put the entire pack in the brooks... *and still had to cinch it down*. First loaded impression, the Brooks is more comfortable than my old naos or my old-old bora. The suspension layout was intuitive enough that I adjusted it easily enough. The conversion to a 1200 ci daypack eluded me until just now... the compression straps wrap around the *frame* and clip to themselves. I couldn't find the loops. No loops needed! The postie who dropped the pack off (she's a mountain fanatic and a buddy of mine, now) and I were very pleased by the build quality. Very solid, and the functional design touches make me jealous I didn't think of them. The two strap waistbelt seems like a particularly neat idea so far. Dad-bod lard aside (darn kids! ), I like it. I put my belt buckle between the two straps, and that seemed to cure the pouching pant-front I've always sported when backpacking. We'll have to see when it's game time, of course. With a bit of luck, I'll be putting moose quarters (or eighths... maybe sixteenths. I'm a shadow of the man I was) in the pack the last week of september, so I'll update my review.